Update: Oxygen OS 5.0.4 is now available for download with latest July 2018 Android Security Patch. 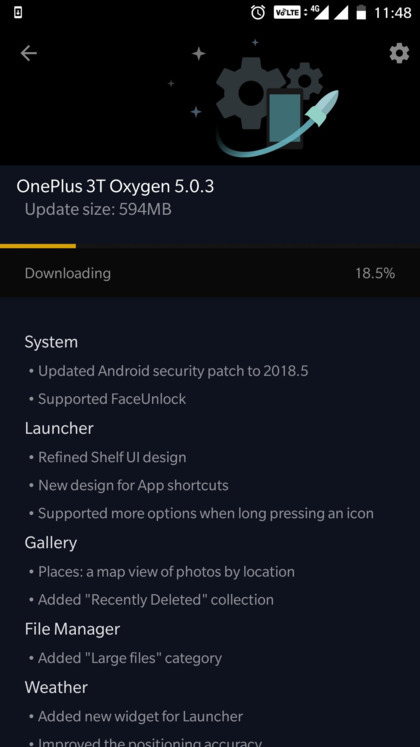 The previous Oxygen OS 5.0.3 brought Face Unlock feature, May 2018 Security Patch, new OnePlus Launcher, updated File Manager, Gallery, and Weather app. An official build of Oxygen OS 5.0.2 is also available for download in select regions. Details below. As we know, OnePlus 3 and 3T devices have already been updated to Android 8.0 Oreo with the first official build of Oxygen OS 5.0. Some users were quite disappointed with the update due to the many bugs they faced. 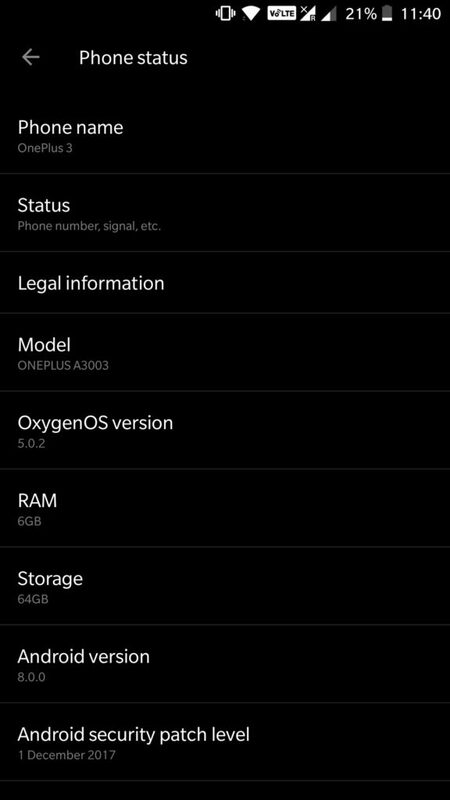 Now, the manufacturer is pushing yet another Oxygen OS 5.0.4 towards OnePlus 3 and 3T. This comes with several features, bug fixes, and stability improvements. So download and install the official Oxygen OS 5.0.4 OTA and full signed firmware zip from below. The update improved mage quality of the front camera, fixes manual ISO settings, fixed parallel apps bugs for WhatsApp, and front camera zoom-in for Snapchat. It also features the newly introduced aptX and aptX HD audio codec support for Bluetooth. This will enhance the audio streaming and quality for Bluetooth connected devices. Although this new feature was already introduced in Android 7.1 Nougat for OnePlus 3 and 3T, the Oreo lacked it. Now, the features have been re-added into the Android 8.0 system. You can find the aptXHD option in Developer Options. Other great features introduced into Oxygen OS 5.0.1 include Wi-Fi hotspot device manager, and “adaptive mode” screen calibration. The names are self-explanatory. You will also see the latest December 2017 Security Patch. Oxygen OS 5.0.1 is based on Android 8.0 Oreo and may soon be released for OnePlus 5 and 5T as well. Moreover, if you would like more such updates, then install the latest Open Beta for OnePlus 3/3T. The benefit is Face Unlock feature from OnePlus 5T is to coming to OnePlus 3, 3T, 5. Latest Oxygen OS 5.0.4 is now available with great features. Download and install the OTA from below. Currently, only the OTA update zip is available, we will soon post the Oxygen OS 5.0.3 full firmware zip here. You can also find the full firmware downloads on the following links. Copy and paste it in Browser address bar. The above files are full firmware updates. See how to install full Oxygen OS firmware packages using Local Upgrade method. How to download OTA updates? Meanwhile, you can capture the OTA update using a VPN app. Apparently, the OTA is now live in regions of Germany and Canada. So download a VPN app like Opera VPN and change the location to the countries. Read: How to install OTA updates on Android devices? But first, make sure your device is running the official Oxygen OS 5.0 OTA update. Later, go to Settings > System Updates > Check for updates. Download OTA and install using stock recovery or ADB sideload method. Meanwhile, you can update to OOS 5.0.1 and then flash this OTA update using ADB sideload method or stock recovery. In order to install it, make sure your device belongs to Indian region. If so, make sure your device is running the previous Oxygen OS 5.0.1 firmware update. This is a big update as compared to the OTA download size. It weighs around 145 MB. It does not simply consist of Android security patch, but it introduces several new features to the device. Following you will find the OTA and full firmware download links. soon. Download and install Oxygen OS 5.0.1 OnePlus 3 and 3T OTA update. As it is too early, the OTA links are not available just yet. OnePlus 3T full signed firmware available. Previous Entry How to update Samsung Galaxy S8+ to Android 8.0 Oreo G955FXXU1CRB7 firmware?